We like to stay busy here at Oncore AV and for that reason, we are very excited about a brand new partnership with Boyne Resorts properties as their exclusive audio visual supplier and coordination team! Starting this year, we’ll be bringing our excellent professional a/v knowledge and experience to Boyne Highlands and The Inn at Bay Harbor, adding yet another layer to their already wonderful resort experience. In Michigan, Boyne Resorts’ portfolio currently includes Michigan’s two premier mountain and golf resorts, Boyne Highlands and Boyne Mountain; and the Inn at Bay Harbor, in addition to eight other resorts across North America. This family owned company continues to build and improve four-season destinations to fit “a way of life” for the active families and friends who gather there. Offering the very best in golf, ski, tennis, biking, hiking and cross-country skiing together with luxurious accommodations, fine dining, cozy restaurants and lounges and exquisite spa facilities, Boyne remains a leader in the industry. Oncore AV has plenty of experience providing audio visual services to the hotel industry from Rotary events that take place around the Midwest to providing for more logistically challenging customers such as the Grand Hotel. No matter the challenge, we’re up to the task of ensuring the success of all our live events. Through this partnership, OAV hopes to further bring professional quality audio visual services to the northern Michigan area! Find out more about Boyne Resorts by visiting their website. Feel free to contact OAV with any questions, comments or concerns at our website or our Facebook page. Oncore AV is pleased to announce a partnership with the West Michigan Whitecaps in the coming 2019 season as their exclusive audio visual providers. In previous years, OAV has provided video engineering services to ensure a smooth broadcast to MiLB every home game night. We will be bringing the same quality and professionalism to our audio and content management services. Last year was the Whitecaps’ 25th season anniversary and the ballpark celebrated with several updated graphics, new games, themed nights at the park, as well as welcoming their 10 millionth fan to the park! Every season certainly does have a story. OAV is looking forward to making the Whitecaps’ 26th season the best one yet with the help of a graphic design and audio visual team dedicated to creating fun and professional animations, videos, and stills as well as delivering quality sound and video coverage to highlight all the fun to be had at the park. Be sure to check out some Whitecaps baseball this summer and see our work in person at Fifth Third Field. Their 2019 season opens on Saturday, April 6th! You can find a schedule of the rest of their season here. As always, be sure to visit our home on the web or on Facebook to see what Oncore AV can do for you! January 14, 2019 – Oncore AV is excited to announce Ben Tafelski has joined our team as our Regional Sales Manager. Ben brings to us his nearly ten years of experience in marketing and sales by way of live events, plastics, automotive, and steel industries. He has previously worked with a diverse clientele in both government agencies and the private sectors. Ben is a Michigan native having grown up in the Grand Rapids area, though venturing out to Kalamazoo, Houston, TX, and Charleston, SC. Ben ultimately decided to move back to his roots in order to be closer to friends and family. Ben holds a B.B.A in Marketing with an emphasis on Advertising from Davenport University. In his role prior to joining Oncore AV, Ben began his professional services coordinating a vast variety of live events with several high profile clients in the greater Grand Rapids area. From there he branched off into the plastics industry where he grew the company’s list of clients; landing clients such as Volkswagen, GM, and Jeep. Among the new responsibilities, Ben can expect to handle at Oncore AV, he will be instrumental in increasing the company’s visibility by continuing to help with the current growth of the company. Oncore AV specializes in audio visual management for live events. For more information, contact Kasey Nemetz at (616) 259-9193. One of our top clients, Blythfield Hills Baptist Church, recently underwent a moderate audio visual upgrade to the sanctuary of their Northview campus. The facility requested to use Allen & Heath products, with which they are familiar and use at their many other facilities. So Oncore AV was able to match them to a GLD2-112 console that would meet their needs. This particular model was ideal for Northview because they needed more faders on their surface. This particular model has an extra bank of 8 control strips, increasing the channel count to 28 fader strips in 4 layers. GLD is a user-friendly, cost effective and scalable live digital mixing system. Image courtesy of Allen & Heath. We also provided a Mini Multi Out Option Card, specifically from Allen & Heath, that allowed the new Allen & Heath equipment to interface with their existing deployment of a Behringer in-ear monitor system. This helped to save the client money while still providing high quality functionality. The Mini Multi-Out card provides a variety of formats of multi-channel digital output at 48kHz sampling rate. Image courtesy of Allen & Heath. 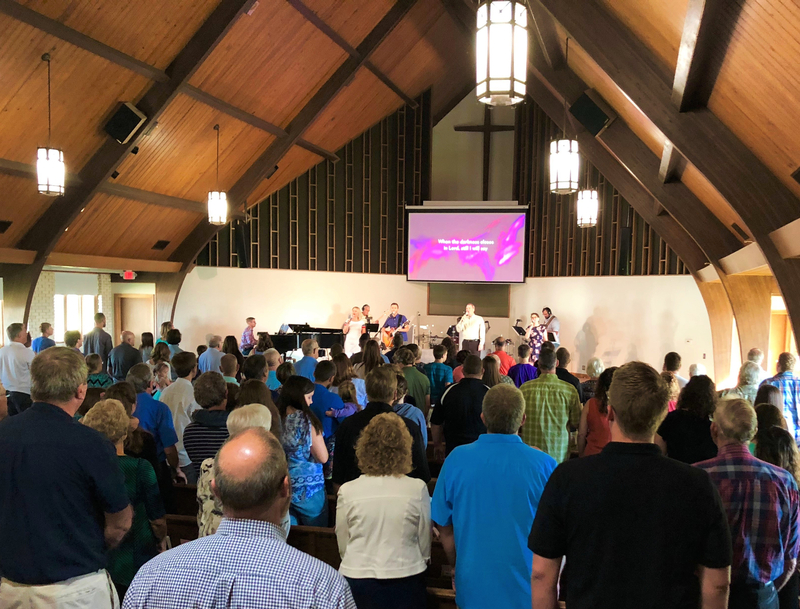 For more information on how Oncore AV can help you get the most out of your place of worship or business, contact us at 616-259-9193 or visit us at our home on the web! Oncore AV strives to match each client with the ideal equipment that will compliment their space, function in accordance to their needs and work within their budget. For our recent installation at the Ensley campus of Blythefield Hills Baptist Church, we wanted to equip them with a video projector that would provide a higher level of clarity and brightness that the sanctuary deserved. The Epson Pro L1300UNL Laser Projector was chosen because of it’s 4K Enhancement Technology, which delivers astonishing picture quality — every subtle intricacy is captured. The clear picture provides the congregation with beautifully crisp images, videos and presentations. For more information on how Oncore AV can help you get the most out of your place of worship, contact us at 616-259-9193 or visit us at our home on the web! One of Oncore AV’s core beliefs is to help organizations and small businesses be seen and heard. Most recently, we had the opportunity to work with the local Blythefield Hills Baptist Church on their latest expansion to the new Ensley campus in Sand Lake. 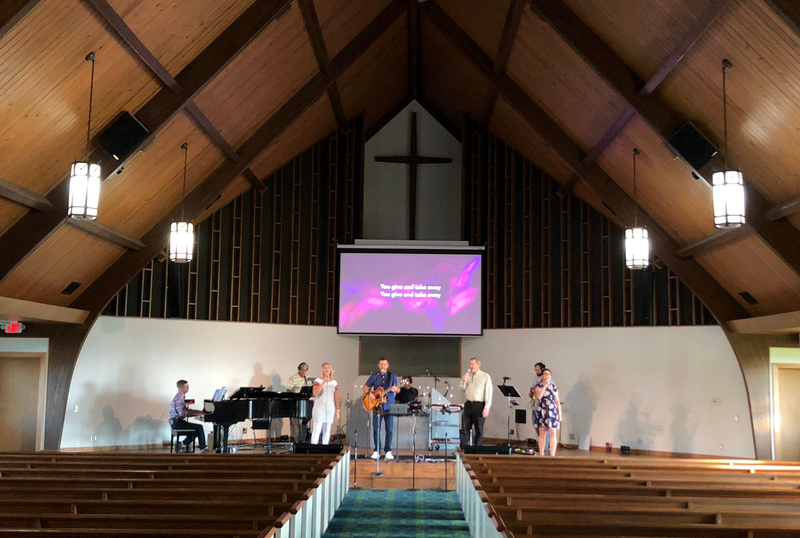 For this renovation, Oncore AV was challenged to design and install an entirely new A/V system that would work with the budget of the project as well as meet the needs of the church. At Ensley, Oncore AV used JBL products like the CBT 1000 line array speaker, a great choice for a place of worship, as they offer tapered horizontal wave-guide which delivers superior coverage in both the front and rear corners of a room and to provide consistent front-to-back sound levels and clarity. The speakers also blend in with the space’s decor aesthetic. The sleek design and low profile allowed the speakers to virtually “disappear” into the design of the back wall of the sanctuary. The sleek design of the CBT 1000 speakers camouflages them against the background design of the sanctuary. Can you see them hanging just beneath the first row of lights? Oncore AV strives to match each client with the ideal set of equipment that will compliment their space, function in accordance to their needs and work within their budget. Oncore AV has been fortunate enough to work with some incredible local businesses on their audio visual installations and live events. A recent customer, Paragon D&E, is a certified small business that provides full-service tooling and machining with design and build capabilities. Paragon designs and manufactures prototype to production tooling in aluminum, steel, Invar and composites for simple to complex aerospace parts. With 50+ ton crane capacity and machines from 1 ft. to 52 ft. in length, Paragon is equipped to handle any sized project. For a recent event which was held directly on the Paragon factory floor for Autodesk Powermill, Oncore AV faced the unique challenge of providing audio and video services that could compete with the noise of machinery and visitors. 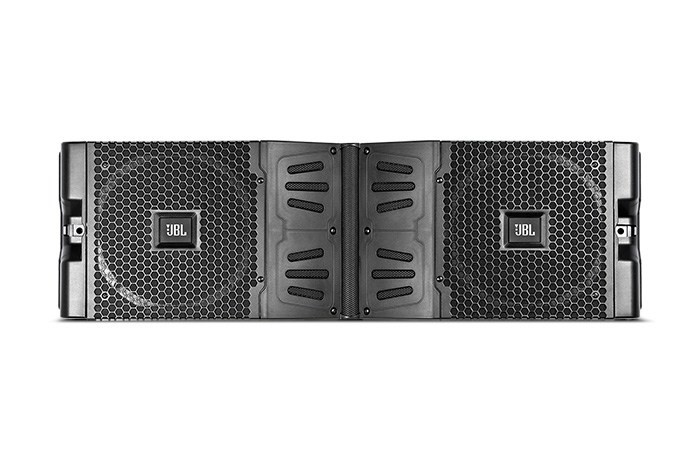 We decided to bring along elements of the JBL VTX line array system for the solution. With this particular venue, this speaker system was necessary to cut through the noise of the crowd with high gain before feedback to ensure the multimedia presentations could be heard clearly. To see if Oncore AV can help produce an event for your business, contact us directly at 616-259-9193 or visit us on the web! In the last few years, you may have purchased wireless equipment which broadcasts/receives 600 Mhz-800 Mhz signals. Unfortunately, those radio frequencies are now corporately owned and will become illegal for public use on October 31st, 2018. And by illegal I mean it will bring a $10,000 fine from the FCC. In addition to that, your service can be over taken. Only the new owner of these frequencies can broadcast on them, that means your church service is set to be interrupted by a higher power (not an angelic one). Unfortunately, there’s no way around it. You will have to replace your system or pay the fine. Don’t worry, Oncore AV can help. We can help to coordinate the rebate that will give you back up to $500 per channel from Shure. But you need to act fast as these rebates are only offered through an extended deadline of October 31st, 2018! We will walk you through the process regardless of the manufacturer of your current equipment and can help you get the trade-in rebate of up to $500/channel on comparable new Shure equipment. We can also consult on what options you have for upgraded equipment with this new found money! Find us on the web or contact us directly at 616-259-9193 for more information! America’s Summer Place is full of excitement this time of year and Oncore AV is gearing up for a busy season of live event production. 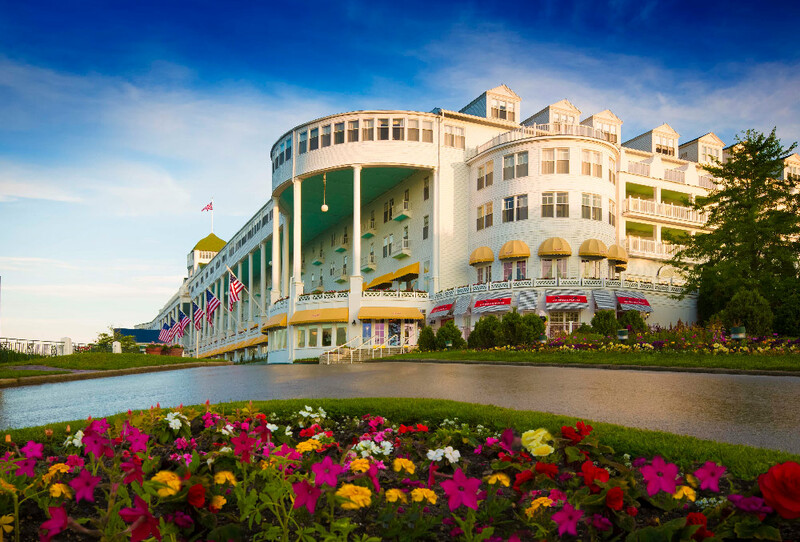 Several of those events take place annually at the Grand Hotel, one of Oncore AV’s most outstanding customers. The Grand Hotel, plays host to dozens of conferences, seminars and other events each year. 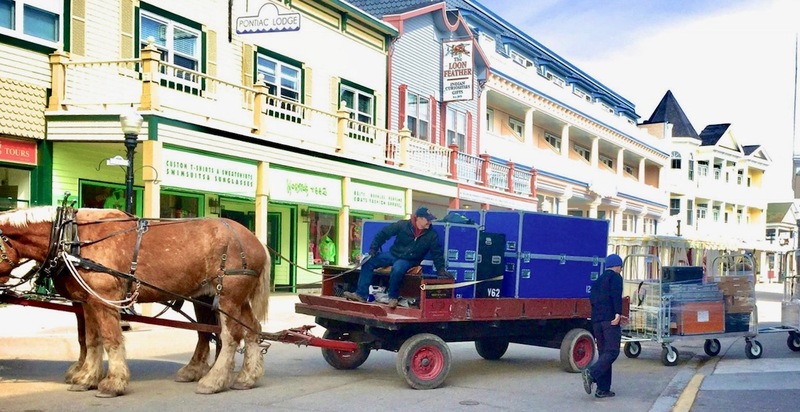 Located on Michigan’s Mackinac Island, it is a beautiful place to spend a summer vacation as a guest, but it can also present as a bit of a logistical challenge in terms of transportation and equipment delivery for a live event. Oncore AV’s first goal is to make sure that we pack light enough to fit all of our equipment, supplies and personnel onto the ferry from the lower peninsula to the island itself. Secondly, we need to coordinate transport from the mainland to the island through one of the ferry’s from Shepler’s Ferry Line which depart every thirty minutes. Once on the island, everything is transported by horse drawn dray as there are no motor vehicles permitted. So, we must ensure that everything we bring along can be fit onto the dray and be light enough to be pulled by the horses. Secondly, we pack all of our equipment in airtight and waterproof cases to protect from the elements. Because of our long relationship with the Grand Hotel, and as a general desire to provide excellent service, Oncore AV is willing to go the extra mile (or 240 miles) to satisfy our customers, regardless of the challenge. No matter the challenge, Oncore AV is up to the task of ensuring that your live event is successful. To see if your event could benefit from Oncore AV’s expertise, contact us directly at 616-259-9193 or on the web! Oncore AV equipment being transported on a horse-drawn dray. Photo courtesy of Oncore AV. In the past few years, there has been a dramatic increase in the use of streaming video and people are watching more video-based content than ever before. Utilizing this ever growing platform can help your business grow and Oncore AV is here to help you stay connected with your customers through live-streaming technology. Utilizing the same equipment we use to stream larger corporate conventions and live events (The Blackmagic ATEM Studio Pro Switcher), we can help your group or business reach your target audience through Facebook Live, YouTube TV or U-Stream. For more information about live-streaming or what Oncore AV can do for your group or business, contact us directly at 616-259-9193 or visit us at our home on the web!